For somebody who make aviation art, plastic kits, model review, articles in publications should be real pleasure to make fusion of all of this in one single article. I have a unique chance to make such an article for Eduard digital publication and this is published in August 2011. And that was my first time to make something for completely digital publication as well from 1991 I publish all my works in printed publications. 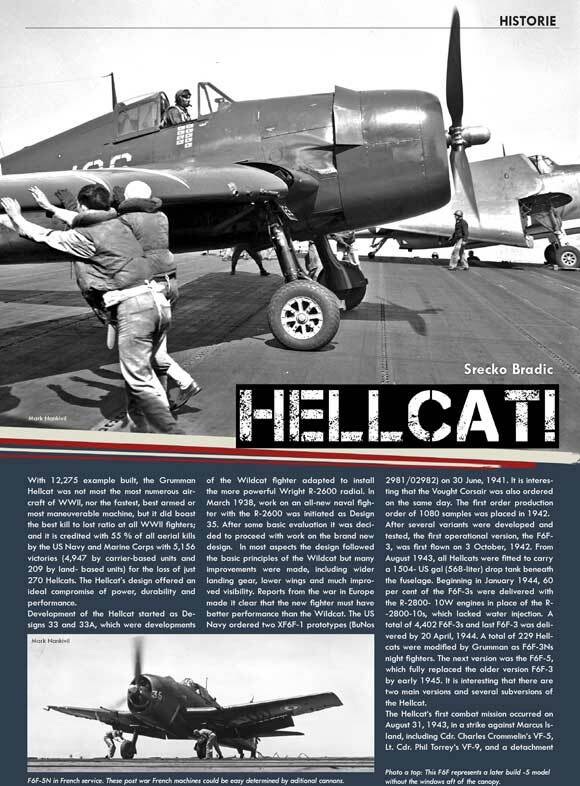 I am contacted by Eduard for this type of article and this come in right moment when their brand new model of Hellcat were released but this time in 1/72 scale. There was no easy way to decide how to make article as well it need to be short but in other hand enough informative and attractive which could generate more interest in new kit as well old kit in larger scale. Article is made in my compact way with fusion of text, archive images and color profiles. After some polishing article is released by Eduard in their digital publication and it have top impressions. For me that was unique experience and in some way interesting way to relax. This entry was tagged article, Digital, Eduard, Hellcat, Srecko. Bookmark the permalink.